Recently Laurie and Odel, of Semi-True Tales of our Life on the Road, have been staying in Joseph, Oregon. Like so many others, I love Laurie’s blog; wonderful writing, beautiful photos, great humor and always interesting. Laurie’s blog was the only one I followed for several years before I had any clue there was such a thing as an RV blogging community. Last August, when we met in Minot, Laurie brought me up to speed on RV blogging in general, introducing me virtually to Rick and Al and many others. But I digress. Mapping soils in the wilderness of Hells Canyon was one of the highlights of my career. At that time, GIS (Geographic Information Systems, a fancy name for maps on a computer) was just a budding science, and our crew was part of a pilot project using digital imagery and digital elevation data to evaluate landscapes. It was called the Soil Landscape Evaluation Project, SLAP. To the current generation of mapping soil scientists, this stuff is old hat, and Digital Soil Mapping is the way of the future. In the mid 80’s however, we still used aerial photographs and a stereoscope to make soil maps. For the Hells Canyon project, however, we had several hundred thousand inaccessible acres to cover in the most efficient manner possible. With the cost of the helicopter and the pilot, we had to make our choices count. We used the SLAP project methodology to determine the sample pit locations by evaluating the slope, the aspect, the vegetation patterns, and with the geology and climate maps we determined positions that would best represent what was most typical for that particular set of parameters, since how soils form is directly related to those variations in climate, vegetation, geology, and landform. My tent is a bit a part from the guys on the left side of the photo by the tree. Then the real work began. I worked at that time with a crew of six, of course I was the only woman on the crew, since soil mapping in those days was usually done by men. Some of the men I worked on this project with are still pretty important in the world of soil survey. Pete Biggam is now the lead soil scientist for the National Park Service, Tom Hahn is the MLRA Leader in Colorado, and Mark Keller has retired after a wonderful career mapping soils in the west. If you look very closely, you can see our camp on the upper right side of the ridge next to the trees. At that time, the soil survey office for Lewis-Nez Perce soil survey was in Lewiston, Idaho, and I still remember the excitement of loading up the trucks with all our camping gear and food for the duration and heading south into the wilderness as far we we could go on a rough dirt road. Our campsite was on a high, flat ridge overlooking the wild canyon, broad enough for the helicopter to land and for us to set up a base camp. With a huge campfire and a great supper we settled in to the dark night anticipating the days ahead with excitement. During that time period, soil survey in the west was well funded, and several crews were using helicopters for access, but it still wasn’t something that was very common. Sunrise from our ridgetop camp was always gorgeous. Our days were long, up at sunrise with a good breakfast over the fire, we would then suit up in our flight suits, load up our maps, aerial photos, shovels and description kits, and pile into the helicopter. Even though I tend to get seasick, I was never bothered in the helicopter. The pilot was an old Viet Nam vet who owned the copter company in Lewiston and was a great guy. I rode in the navigation seat, locating our predetermined sites, with my mapping partner in the back seat. The pilot would land that copter on one runner on a rocky ridge, hovering as we bailed out with all our gear. There were three crews of two people each, and he would drop each pair to a site and then spent the day leap frogging from site to site. Our job was to get full soil descriptions in the hour that we had before the copter returned. The two of us hiked down opposite sides of the mountain, dug a pit as deep as the soil required, and described our soil. Lucky for us, the soils in the canyons were usually less than the five feet deep required for a full description and we would get stopped by hard bedrock ranging from a foot to 3 feet deep. We would then climb back up with our tools and soil sample boxes, packs and shovels and be ready as the helicopter approached and hovered and we climbed back inside. I’ll never forget the engulfing silence of the canyon as the copter left and I hiked down to my pit location. I remember sitting silent and still as an unwary coyote trotted past me sitting by my pit, oblivious to the idea that there could be a human in this wild place. We did ten to twelve sites a day, and by the time evening rolled around we were all pretty much exhausted. Of course, we had only limited water on our high ridge, but the pilot took great care of us. In the late afternoon light, he would drop us into a sandy beach on the Snake River and we would all swim and laugh and cool off before he took us back to our high ridge for another night of canned beans and a big campfire. This is one of my favorite photos of Pete. Great Legs! Throughout my career, I had the opportunity to map in many wild places, but Hells Canyon was the wildest, the most magical and remote and something I will never forget. At the time, I was also a wife and mother, in my 40’s, and my husband was the long-suffering spouse who managed the farm and teenagers until I would come home on the weekends. It was always fun when he picked me up on Friday nights after my week in the wilderness. He would meet me with a bouquet of flowers when things were especially bad. The time my daughter broke her leg getting thrown off her horse was the Friday night that I got the biggest bouquet. There weren’t cell phones or internet at the time, so I was inaccessible for a week at a time. I still remember him saying, “OK, what do you want first, the good or the bad?” The good was often an especially big load of peas on the vines, and the bad was often related to whatever craziness the teenager would get into. Good days, all of them. Just thought it might be fun to share. Thanks for reminding me, Laurie. The longest day of the year, the shortest night, the beginning of summer, time to celebrate. I love to celebrate the turning of the seasons, the changing of the light. I ring bells at Winter Solstice, with that wonderful feeling that winter light will be lengthening and summer returning. In the midst of the summer solstice is the thought that already the sun is turning away. Strange thought when summer has only just begun to warm the forest here and the trees are only now fully leafing out. The weather on this first day of summer did not disappoint us, with the hottest temperatures of the year so far. It was a gorgeous, crystal clear, beautiful, 80 plus degrees today, and I think I could see the tomatoes growing taller as I watched them. We didn’t do a Solstice party, but we did have a bonfire last Sunday night. With the formal notification of the beginning of fire season, the last day for outdoor burning was June 20, so we invited the neighbors and built the last big outdoor fire of the season. Wes and Gayle live most of the time in Arizona, relocated there after many years in Oregon. Their place here is a lovely mountain home , just across the road from our house, and it’s nice when they return for the summer. They waited a bit this year because of our cool temperatures, so we were glad to see them come back in time for some neighborly visits before we leave for Alaska. Of course, it’s also nice that they are here since Wes is our resident summer lawn mowing person and house care-giver while we are gone. Wes has no grass to mow next door and seems to get a kick out of riding around on Mo’s mower. At least that is what he says. Personally, I just think he is a truly kind and generous neighbor! Gayle has treated us to many lovely meals, both here in Oregon and when we have visited them in Arizona in the winter. When I invited them over, I said to come for hot dogs and a meal composed entirely of non-home-cooked food. Most of the time I love to cook, but lately with the extra work weeks taking most of my time, not so much. Our get-together was more about a chance to have a fire and enjoy the outdoors than it was about eating. We did have a good time, in spite of the store bought picnic, and the hot dogs roasted over the fire on a pitchfork hit the spot. I even found humongous marshmallows, big as a fist, labeled appropriately “campfire marshmallows”. I laughed so hard when we tried to eat them, they were HUGE and sticky and Gayle needed a fork and a plate to deal with just one. In the past couple of weeks we had 7 cords of juniper delivered, huge rounds that Mo splits with the hydraulic splitter. It’s a hard, hot, and nasty job, and this time she has avoided huge divots in her legs created by flying chunks of wood with the soccer shin guards I got her for Christmas. Mo does all the splitting and we share the stacking chores. The loads come 3.5 cords at a time, and it took us three days to do the first load. Today we started on the second. The juniper is reasonably priced firewood, but it is full of huge knots, one of the reasons it looks so beautiful in woodcrafts. Juniper is encroaching on the native grasslands in Oregon, and the juniper eradication program is making an attempt to take it back a notch. The result is lots of big, dry juniper, needing a home for the winter. We are happy to oblige. I love it. It crackles and snaps, not a problem in our enclosed stove, and it burns hot and long. Mo loves it less, see previous entry regarding shin divots. Today she said something to the effect that we had enough juniper for a couple of years and next time we were going to order it split. She thinks the cost of split wood might not be as much as a busted splitter. Mo fed our campfire with some of the huge rounds that were impossible to split to a reasonable size. I brought out the fancy Thermocell mosquito repellent device, along with the Off Clip-On device and tried to keep the biting monsters at bay. Wes was about ready to head back for Arizona, since even with the fire smoke and all the devices, the mosquitoes still were trying to have us for dinner. Must have something to do with the nice days warming up and everything is hatching beautifully. The weekend of the 12th was the big graduation weekend in Klamath, and town was filled to the brim with celebrants, including my niece Savannah. My granddaughter Hillary will also be graduating in a few weeks from Klamath Union High School. Hard to believe that little baby girl is through with high school. On Friday, the 10th, my friend Maryruth ( we are getting close to 50 years of friendship) and her husband, son, and daughter-in-law returned from an Albany graduation via Rocky Point. Mo and I turned over the big house bedrooms to them and spent the night in the guest cabin with Abby and Jeremy. It was a great way to be sure that the cat didn’t do his friendly cat thing and scratch at the guest room door till they opened it and purr all night on Maryruth’s chest. The cabin is a real treat, with morning sunlight and a warm little wood stove for the night chill. I cooked a real supper for them, no store bought stuff this time, plank grilled salmon with lemon hollandaise, fresh asparagus, and salad from our greenhouse garden. I even made an old fashioned apple dump cake for dessert. Yum. One of the great old traditions of Rocky Point are the amazing little steamboats that come here every year. Not your average big boat, but beautifully built little water crafts that are operated by true wood-fired steam engines. We heard the toots from the house and decided we definitely needed to run down to the lake to check them out. We also wanted to check out the newly remodeled resort. Rumor had it that there was a new bar adjacent to the existing restaurant, so we were happy to find out the rumor was correct. After walking along the dock to admire the steamboats, we enjoyed the beautiful view of Pelican Bay from the restaurant for just the price of a round of drinks. It’s wonderful to have friends stop in and visit. It’s also nice to have a special little place close by to have a nice dinner with a gorgeous view. Note to self: dinner at Rocky Point Resort soon! “Squirrels are nothing more than rats with fuzzy tails that can climb trees”. This comment was posted on Judy’s blog today and I laughed out loud. Of course, I also feel that way about deer. Cute in the forest, far, far away from where I live, but nothing more than big rats with voracious appetites in my yard. Between the squirrels, the rabbits, the deer, the voles, and the mosquitoes, I often wonder about the joys of living in the forest surrounded by the lovely wildlife. Thanks to the mosquitoes we also have a healthy population of bats, good wildlife of course, but a bit less so when they buzz our heads in the evenings while lounging in the hot tub. Oh yes, chipmunks as well, lots and lots of them. Just caught myself in a great big “sigh”. We have a very large hole in the ground along the back property line between the lawn and the forest that also ha s some kind of critter playing around that is much bigger than a squirrel and I think bigger than a rabbit. Abby’s favorite thing is racing out the door to the back yard in pursuit of whatever furry thing is out there. I have been hearing a lot of owls around lately, many voices of many different types, and am gleefully hoping that they are here because of all the other fuzzy critters that are around. Help! Yesterday I sprayed the entire property boundaries with Liquid Fence, sworn to work by my friends in a California forest. Gerald said he used it all summer last year and the deer ate everything in sight in the neighbors yards and left his alone till he got lazy and quit spraying. It’s not a cheap endeavor, at 40 bucks for 2 applications, and directions that say “Apply weekly initially, then every three weeks after that”. I am applying weekly, with special attention to my roses, delphiniums, azaleas, and the baby flowering pear tree that the deer decimated last fall. Of course we have the greenhouse for the hidden veggies, “nahh na na NA na”! Other folks who have lived at Rocky Point for 30 plus years have learned to quit trying to grow things that the deer love to eat. I’m still not that smart. I WANT my roses and delphiniums, so I will continue to try to outsmart those pesky critters. When it comes to the squirrels, I think I have won, at least so far. Of course I don’t have those flying stinkers that seem to be the problem at Al’s place in Ontario. I hung a thin wire cable between the trees in the forest, just beyond the grass, and so far the poor squirrels are completely stumped and reduced to foraging on the ground for what is scattered there by the yellow headed blackbirds, voracious eaters who like to shake all the seed out on the ground for entertainment. Lucky for me, the blackbirds all manage to head for the marsh by mid-summer and no longer eat me out of house and home. This time of year I am filling all 8 feeders with four different kinds of food every single morning! So far the black headed grosbeaks outnumber most other birds, but we have a lot of purple finches, evening grosbeaks, stellar jays, juncos, and a very friendly white headed woodpecker. Geez! I am feeling not a little bit guilty about how devastating it might be to our little bird friends when we leave for 7 weeks in Alaska. Hopefully in July and August food will be so plentiful they will somehow manage. I don’t set up hummingbird feeders for just that reason. I have heard how dependent they get on the feeders and how important it is to be consistent if you start putting up food for them. I have to thank everyone for the lovely comments on my last post photographs. I didn’t mention it because I was feeling a bit insecure, but that was the first day I was out with my new Nikon DSLR D5100. All those photos were my learning experience. I have discovered that my “learning experience” may go on for several years at least. I have stepped up from shooting everything with the “auto” setting, a perfectly acceptable way to take photos. The water photo that folks seemed to like was an attempt at aperture priority slowing down the shutter so I could get that silky movement. This photo of the east side of the yard early in the morning is my first attempt at HDR. So much to learn, and so little time. Sigh. My knitting has been languishing on the shelf while I play with the camera and fight the critters and garden! I think I started the perfect easy little scarf back in Eureka with gorgeous hand dyed yarn, and am still barely half way through the skein. Maybe I’ll have a chance to knit when we are back on the road, although I would imagine it won’t be on those bumpy frost heaves on the Alaska Highway. Can you leave the MoHo at home to go on a picnic? For several days now the weatherman has hinted at lovely spring weather just over the horizon, and we thought it would be great to take a day trip and just enjoy the sun and warmth. It’s been such a long, cold spring, with very little sunshine. With a 70 degree forecast for last Sunday I decided that a nice little road trip to explore the Applegate Valley and Jacksonville would be fun. We woke to gray, cloudy skies and a thermometer that struggled to get to 50 degrees. Around 11 there was a bit of a break and we decided to make the break ourselves and go for it. I made egg salad sandwiches and loaded up our backpack picnic kit with wine, chips, and cherries, and we jumped into the Lexus for a comfortable car trip over the mountain. Even though it was cloudy all day, we had a good time and enjoyed doing something different for a change from gardening and working around home. Although we do drive to Medford fairly often, there are some side trips around Southern Oregon that we still haven’t seen. The Applegate Valley is one of those trips. The route took us over 140 as usual, but we left the main highway to travel through Eagle Point and then took another side road from Eagle Point through Gold Hill to avoid the standard Interstate 5 route to Grants Pass and the beginning of the Applegate Valley Trail. The trees on the west side are fully leafed out now, with myriad shades of verdant green. Most of the flowering trees are past their prime bloom while those we have at home are just barely starting. I think Rocky Point is at least a full month behind the Medford area when it comes to the spring season. We ambled along Highway 234 west through the Sams Valley, crossing the Rogue River with a stop for photos of a local bridge. The river was running wild and full to it’s banks, but even with all our rain this year, I haven’t heard much about flooding. Continuing west through Gold Hill, we found ourselves in the midst of some kind of “Gold Hill Days” with the main street north completely closed off by vendors and booths and many antique cars. If it had been a bit easier to park, and if the day had been sunny and warm, we may have allowed ourselves to digress from our planned destination and check out the events. Instead, we routed back over the river and under the interstate to wander peacefully along meandering old Highway 99 until we reached the turnoff for the Applegate Valley just south of Grants Pass. The Applegate Valley Wine Trail is one of Oregon’s newest “appellations”, with a climate that is warmer and drier than much of the Willamette Valley wine areas. The vineyards follow the river along the higher stream terraces and support Chardonnay, Syrah, and some Bordeaux red wines. Oregon is famous for some of its Pinot Noir’s, so the valley offers something a bit different. Mo and I enjoy good wine, but sometimes the pretentious aspect of “wine tasting” will keep us from dropping into these little wineries. This time was no different, we drove by the beautiful signs, enjoyed the gorgeous views, and enjoyed the ride without stopping for a taste. I think that sometime I would enjoy touring the wineries with friends, or even with a group. Our summer neighbors in Rocky Point often travel this route and come home with cases of really good wine. I think we may go with them sometime to get our wine tasting feet wet. Except for our little foray in the Finger Lakes District of New York last fall, the last time I really did some extensive wine tasting was in the Napa Valley back when the pours were free! Of course, I have no such reservations when it comes to nurseries. Near the tiny town of Murphy, we passed a riot of color along the highway and within seconds, Mo whipped around and we checked out the most beautiful nursery full of hanging baskets I have seen in years. The owners were wonderful about me walking around taking photos, but I still felt I should at least buy something token to thank them for just being there. She laughed when I told her we were from Klamath Falls, since she had raised her children in Klamath, and was really loving her long growing season there along the Applegate. I left with some perfect fuchsias for the baskets waiting at home for sunnier, warmer weather. After a nice stop for Abby on their grassy lawns (doggie bags of course!) we continued down the highway south toward Ruch and Applegate Lake. Another thing that Oregon is noted for are the covered bridges throughout the state. There are several along many of the routes that we drive, and some folks even make a tour of seeing them all. South of Ruch, only eight miles north of the California border, is Oregon’s southernmost span, the McKee Bridge. Built in 1917 by John Hartman of Jacksonville, it served mainly for mining and logging traffic until 1956 when it was finally declared unsafe for vehicular travel. In the early 1980’s, townsfolk were troubled by the strength of the bridge, and in 1985 more than $40,000 was dedicated to repair the bridge and keep it open for pedestrians. The bridge has a 122 foot span, 45 feet above the Applegate River and is supported by a Howe truss with beautiful flying buttresses. The scenic little park, built by the CCC in the 1930’s nestles into the west bank of the river by the bridge. An amazing special touch were the wooden panels installed on the original bridge siding, specifically dedicated to folks who wanted to add their own touch to the bridge, aka graffiti. The best part was that the graffiti was actually confined to the dedicated boards! It was here that we found a perfect place to pull out the sandwiches and wine. I guess I should have taken photos of the signs posted on nearly every single tree and table and fence post, proclaiming loudly in capital letters, NO ALCOHOL. Thank goodness I don’t have as many readers as Al, who was lashed for talking about lemons, or Rick, who was castigated for doggie’s off leash, because I opened my bottle of wine and poured it into the little plastic picnic glasses with relish. We sat by the river at the substantial old picnic table for a long time, enjoying the water and our lunch. We were even treated to watching a couple of folks walk down to the river, drop in their lines, and seeing a good sized trout jumping on that line after the first cast! After relaxing, walking, eating and just enjoying the park and bridge, the hour was getting late, but we didn’t want to miss a visit to Applegate Lake, just south toward the California line. So much of the history of the Applegate River and valley are associated with gold discovery, and gold mining, and there are still many folks who dredge parts of the Applegate River for gold. 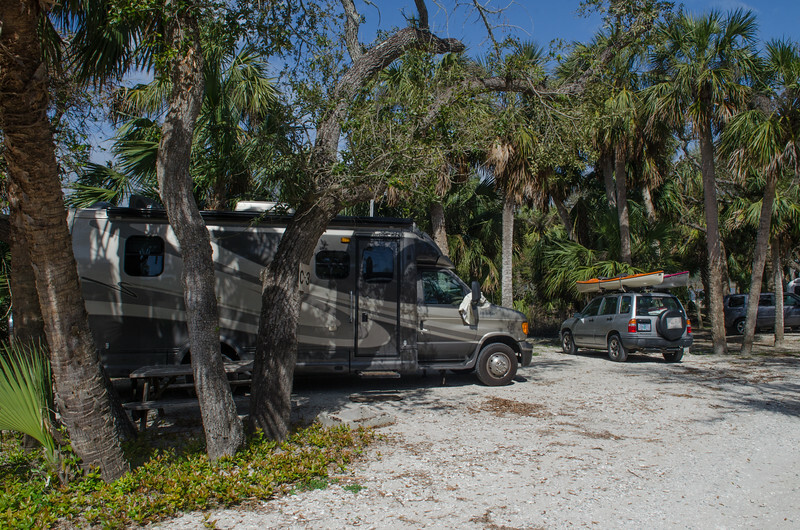 On the banks of the lake, which is dammed, are several campgrounds, and we wanted to check them out. The day was still cloudy and dark, and the campgrounds were very nearly empty. We saw one park, right on the lake, that was basically an asphalt parking lot on the beach and could only imagine just how crowded it might be in summer. The other two parks weren’t very rig friendly and too far from the water’s edge to comfortably carry down our kayaks. It might be fine to go to the parking lot campground early on a weekday in the summer to try kayaking the lovely lake with it’s complex shoreline. The rain didn’t start up until we drove through Ruch on the way to Jacksonville. I love Jacksonville, an historic little town with shops and restaurants and beautiful trees. The Britt Festival is held here each summer, and Mo and I have been to many great shows on the lawns of Britt. Today, however, we just drove through, deciding to save more explorations of Jacksonville for the last of summer Whole Town Garage Sale. Jacksonville is lovely, and also very expensive. The homes are either new and gorgeous, or old and even more gorgeous, and I swoon over the perfectly restored Craftsman bungalows, many of them which serve as Bed and Breakfast establishments. By the time we got back to Rocky Point it was late evening, still light thanks to the summer twilight, but late nonetheless. I was glad that we made our little trip in the “big car”, rather than in the little tow car. The Lexus comes out for special occasions and local trips, but will never be towed behind the motorhome! It’s comfortable and roomy, although I have to say that the big leather seats in the MoHo are my favorite. That’s a good thing, since within less than a month we will be embarking on our Alaska journey and I will be in those seats for several weeks!